American travel book publisher Let’s Go has named Molenmuseum De Valk in Leiden, the Netherlands, as a unique travel destination with outstanding service. 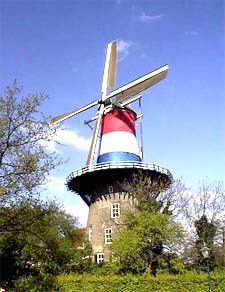 The windmill, whose name means “The Falcon”, was praised for a clear and informative exhibit on Dutch cultural heritage. Let’s Go also found the value for money excellent and complimented the museum on its multi-lingual presentation. Since 1997 Let’s Go guides have been awarding the title of “exceptional businesses” to organizations which conform to their high standards of service and quality. The museum may now proudly display a Let’s Go Recommends sticker in the window. Information in the museum is presented in Dutch, English, German, and French. There is an audio-visual presentation in Dutch and English. The museum is open 10am to 5pm Tuesday to Saturday, 1pm to 5pm on Sundays. Admission for adults is 3 EURO. This entry was posted on Thursday, February 9th, 2006 at 10:40 am CET and is filed under Leiden, Life in Holland, Travel	with tags . You can follow any responses to this entry through the RSS 2.0 feed. You can leave a response, or trackback from your own site.